A view of Lake Geneva and the Lavaux vineyards from the home of Cyril Séverin, owner of Domaine du Daley. His winery dates back to 1392, making it one of Switzerland’s oldest. The wine in this country is so good, they don’t want to export it — keeping 98% for themselves. The Beau-Rivage Palace hotel in Lausanne, on the shores of Lake Geneva, maintains one of Europe’s great wine cellars. Earlier in the day I’d made my way through it, a maze of 80,000 bottles extending all the way under the tennis courts, with sommelier Thibaut Panas. The cool underground rooms held the usual suspects—grand cru Burgundies, first-growth Bordeaux, Barolos—as well as plenty of fine Swiss wines. It was one of the latter that I was drinking now, as I sat on the terrace at Anne-Sophie Pic, the acclaimed French chef’s namesake restaurant at the hotel: a glass of 2007 Les Frères Dubois Dézaley-Marsens Grand Cru de la Tour Vase no. 4. A Chasselas from the terraced vineyards of the Lavaux wine region, just outside the city, the white wine was rich, complex, and subtly spicy all at once. And it was exactly why I’d come to Switzerland, since there was little chance I would ever find it back home in the U.S. The Beau-Rivage was built on the Swiss side of the lake in 1861, and it’s what a grand old European hotel should be, which is to say it keeps the feeling that you might at any moment drift into a black-and-white movie set between the wars. Its Belle Époque salons, ballrooms, and suites have played host to the likes of Charlie Chaplin, Coco Chanel, and countless others accustomed to grandeur and privilege. Case in point: the woman in red leather pants at the table next to mine, who was surreptitiously feeding morsels to her miniature dachshund. The dog would poke its snout out of her red leather handbag to receive bites of $85 duck, then disappear. It had manners. I drank my good Swiss wine, pondering the quirkiness of rich Europeans. 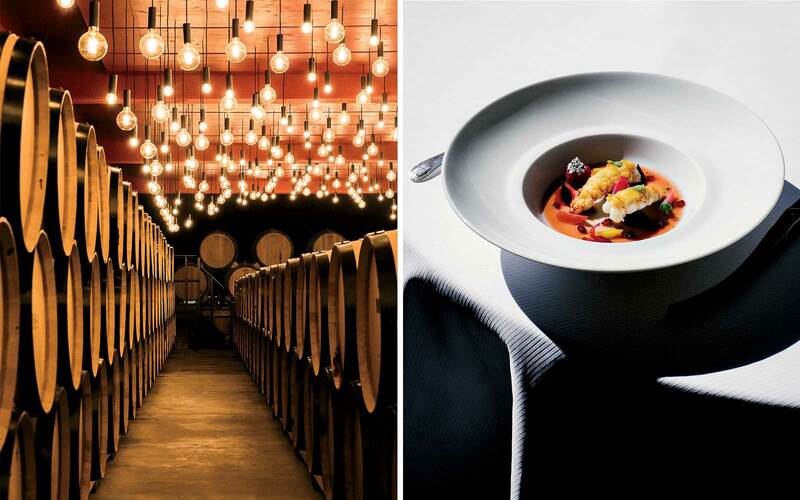 From left: The barrel room at Domaine Jean-René Germanier, in the heart of the Valais, where visitors can taste Swiss varietal wines like Humagne Rouge and Chasselas; langoustines and beets at Anne-Sophie Pic, the restaurant at the Beau-Rivage Palace hotel, in Lausanne. 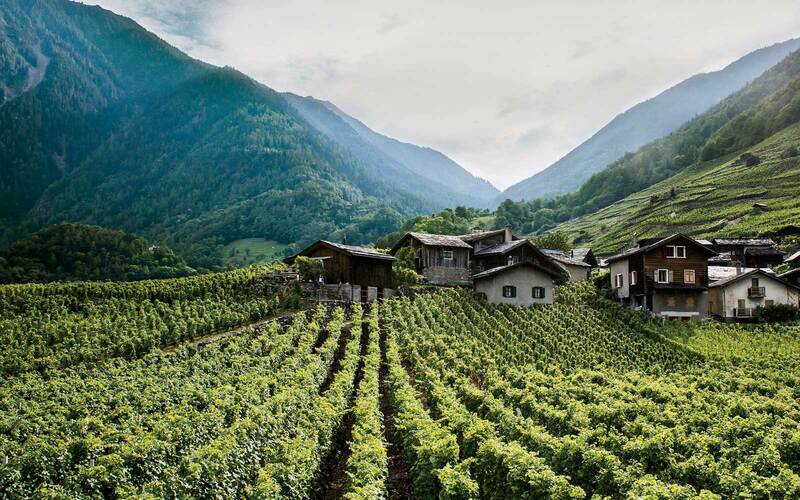 The reason you won’t find much Swiss wine in the U.S. is simply this: 98 percent of it stays in Switzerland, where it’s drunk quite contentedly by the Swiss, who are well aware that their wines are extremely good, even if the rest of the world is not. This situation isn’t entirely intentional. The wines are dauntingly expensive outside Swiss borders, and the fact that they’re made from unfamiliar native varieties doesn’t help, either. A $50 bottle of Swiss Chasselas would be a tough sell in your local American wine store. That said, once you arrive within their borders, the Swiss are more than happy to share. Visiting wineries in Switzerland is actually easier than in many other European wine regions. Most have shops that double as tasting rooms and keep regular hours. Plus, Switzerland’s wine country, which includes the popular cantons of Vaud and Valais, is stare-around-you-in-awe beautiful. All that is to say why, the day after my epic dinner, I was standing with Louis-Philippe Bovard on the Chemin des Grands Crus, a narrow road that winds among the ancient Lavaux vineyard terraces east of Lausanne, in the Vaud. Bovard is the 10th generation of his family to make wine here. “I have just a small piece of vineyard, which my father gave me, which the first Louis bought in 1684,” he said with the kind of casual modesty available to you when your family has been farming the same piece of land for almost 350 years. To our left, the green vines climbed in dramatic steps—some of the stone walls are 20 feet high—up to bare rock and, eventually, the Savoy Alps. Below us they dropped equally precipitously down to the ultramarine waters of Lake Geneva. From left: The waterfront walking path in Lausanne offers ample opportunities for people-watching. The city is the capital of the Vaud canton and close to the Lavaux vineyards, a unesco World Heritage site; a view of Lake Geneva over the rooftops of Rivaz, as seen from the vineyards of Domaine Louis Bovard. The Chemin des Grands Crus sees a lot of foot traffic these days, a consequence of the region’s having been named a UNESCO World Heritage site in 2007. Bovard tolerates this with equanimity. “In September there will be a thousand people on the route,” he said. “They get very annoyed when they have to move aside for my car! But harvest is harvest. The work has to be done. And the winemakers are the ones who built the road, after all.” To give perspective, Bovard’s winery is located in the nearby town of Cully, whose population tops out at 1,800 or so. “And the other villages around here aren’t even this big, maybe three hundred inhabitants,” he added. “But of those, ten to twenty will be winegrowers.” The Dézaley Grand Cru area, which we were standing in the midst of and from which Bovard makes one of his best wines, is a tiny 135 acres, but more than 60 different families farm it. If not for a chance meeting, Aké might still be living in Abidjan, the largest city in the Ivory Coast. In 1988, when he was the maître d’ at Wafou, one of the city’s top restaurants, he went to France on vacation and ran into one of his former professors from hospitality school. They chatted for a while, and eventually the man asked if Aké might like to be on the team for a project of his—in Switzerland. By 1989, Aké had a new life in a very different country. But it wasn’t until the mid 90s, working at acclaimed chef Denis Martin’s restaurant in Vevey, on Lake Geneva, that he fell in love with wine. He began training as a sommelier and, in a remarkable ascent, by 2003 had been named the best sommelier in French-speaking Switzerland by the Swiss Association of Professional Sommeliers. Rather than buy the castle, I ended up at La Colombe’s little shop and tasting room. Paccot, one of the first vintners in Switzerland to farm biodynamically, makes a broad range of wines, both red and white—Chasselas is not the only grape grown here. He set out an abundance of charcuterie and cheeses, and surrounded by bottles, we chatted about the history of the region. As with essentially every European appellation, it was the Romans who cultivated vines here first. Later, in the 10th or 11th century, Cistercian monks established their own vineyards. Lavaux’s spectacular terrace walls were erected in the 1400s by northern Italian masons. By then the Vaud was part of the French-speaking Duchy of Savoy; that was also, Paccot told me, around the time when his family received its coat of arms, which features a dove (la colombe), a symbol of peace, and of course the winery. “It was given to us by Amédée, one of the Savoy counts, because in 1355, my ancestor helped secure peace. Plus, it was easier to give him a coat of arms than to pay him.” Through Europe’s many wars, vignerons grew grapes and made wine here. In French-speaking Switzerland you find local whites like Chasselas, Petite Arvine, Amigne, and Humagne, together with French transplants such as Marsanne (here known as Ermitage) and Pinot Gris (here known as Malvoisie). In the eastern, German-speaking regions, reds are more popular, particularly Pinot Noir (often referred to as Blauburgunder); in Italian-speaking Ticino, Merlot dominates. A vineyard in the village of Le Perrey, in the Valais, where the winemakers at Domaine Gérald Besse source their grapes. I told Besse this and he laughed. He is trim, in his forties, with the requisite interesting eyewear and expensive watch that all Swiss men are apparently issued at birth. An accomplished skier, he’d recently completed the Patrouille des Glaciers, a frigid, all-night, cross-country-ski race covering some 70 miles from Zermatt to Verbier. Proof enough of a lunatic streak for me. His family’s winery, Domaine Jean-René Germanier, opened for business in Vetroz in 1886. But at the moment we were deep in the precipitous Val d’Hérens. The forest we’d walked through gave way to one of his prized vineyards, Clos de la Couta. It is absurdly steep—your average mountain goat would be daunted. But somehow Besse harvests grapes from it, and very good ones at that. His peppery, nectarine-scented 2015 Clos de la Couta Heida (the local name for Savagnin), which we tried later on, was sublime. He also informed me that Val d’Hérens’s true fame comes less from its grapes than its fighting cows. Visual confirmation would have helped me wrap my brain around the concept. But for dinner we did indulge in an equally Valaisian tradition, raclette, at the ultimate destination for it, the Château de Villa, in Sierre. It’s easy to look at raclette and think, “Well, that’s melted cheese on a plate.” And yes, raclette is basically melted cheese on a plate. But sit outside at Château de Villa on a spring night, looking at the turreted tower and white walls of this 16th-century building, and order the dinner tasting of five different cheeses from five different alpages (high mountain pastures) throughout the Valais. You will realize it’s much more than that. At Château de Villa, the raclette master slices great wheels of Raclette de Valais AOC cheese in half, mounts them on metal racks, and positions them just close enough to a fire that the edge of the cheese crisps and the center melts without burning. He then scrapes the molten cheese onto a plate with a single stroke. Some cheeses are more earthy, some more oily, some more floral. All are distinct. After you try all five, you can have more of whichever you prefer, along with “light” accompaniments: boiled potatoes, bread, and pickles. And ask for the pepper mill. The correct amount of pepper? That, Besse told me, is a matter of debate. The next day I took the train to Zurich, because of a new rule I’ve decided to apply to my life: if someone offers to show you vineyards from a speedboat, always say yes. “Good,” he said, leaning back. The cantons of Vaud, Valais, and Zurich offer all the pleasures of the world’s best-known wine destinations without the crowds. 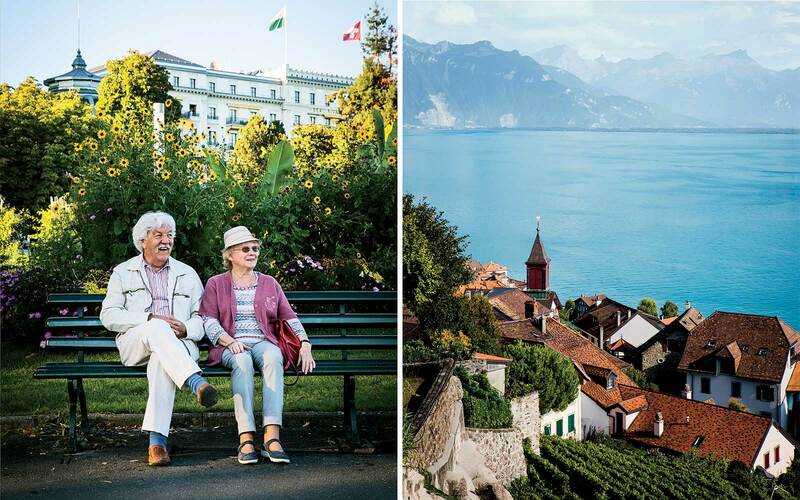 Give yourself a week to experience all three, along with the urban pleasures of Geneva. Swiss International Air Lines offers 73 flights per week from Canada and the U.S. to Geneva and Zurich. To get between cities by train, invest in a Swiss Travel Pass. Though you can visit most wineries and tasting rooms unannounced, a good option is to work with a tour company like CountryBred, which plans dinners with winemakers, luxury transportation, tastings, and more. To explore the wine regions of the Vaud, stay in the city of Lausanne. The recently renovated Beau-Rivage Palace (doubles from $565), originally built in 1861, has spectacular views over Lake Geneva, both from its exquisitely appointed rooms and from chef Anne-Sophie Pic’s namesake Michelin two-starred restaurant. A walk along the Lavaux terraces’ Chemin des Grands Crus, just 15 minutes from Lausanne, is not to be missed. Then visit Domaine Bovard, in Cully, one of the region’s benchmark Chasselas producers. Domaine du Daley, founded in 1392, is in Lutry. Its terrace has the best view of all the Lavaux wineries. Closer to Geneva in La Côte, Raymond Paccot’s Paccot-Domaine La Colombe is another highlight. Make sure to try the three Chasselas bottlings — Bayel, Brez, and Petit Clos — all from different terroirs. I loved dining at Auberge de l’Onde (entrées $13–$41), in St.-Saphorin, where sommelier Jérôme Aké Béda preaches the gospel of Swiss wine and the rotisserie-grilled meats are incomparable. Hotel-Restaurant Didier de Courten (doubles from $240), in Sierre, is a pleasant, relaxed base for your excursions. Thirty minutes away in Ardon, Domaine Jean-René Germanier is known as one of the Valais’s best producers, both of whites such as Fendant (as Chasselas is known in the region) and reds such as Syrah. Twenty minutes southwest brings you to Gérald Besse’s brand-new winery outside Martigny. Taste his impressive wines, such as the Ermitage Vielle Vigne Les Serpentines, from a vineyard planted on a dramatic 55-degree slope. Cheese-and-wine fanatics should try Château de Villa (entrées $11–$55), in Sierre, not only for the raclette tasting but also for the attached shop, which stocks some 650 different wines. Staying in Zurich gives you access to all the attractions of the big city, but just outside lie wineries that produce lovely whites and surprisingly good Pinot Noirs. In Zurich, the Baur au Lac (doubles from $926) is one of the great historic hotels of Europe, built in 1844 — the same year its founder, Johannes Baur, started his wine business, which the hotel still runs. At Schwarzenbach Weinbau, a wine producer 15 minutes away in the town of Meilen, you can sip subtle Pinot Noirs and citrus-apricoty white Rauschlings, available nowhere else on earth. Dinner at Wirtschaft zur Burg (entrées $15–$30), also in Meilen, is excellent. Chef Turi Thoma relies on ingredients such as pike and hare for his brilliantly executed spins on traditional recipes.